Tuck is tapping into a local resource for its global learning requirement—Dartmouth faculty. 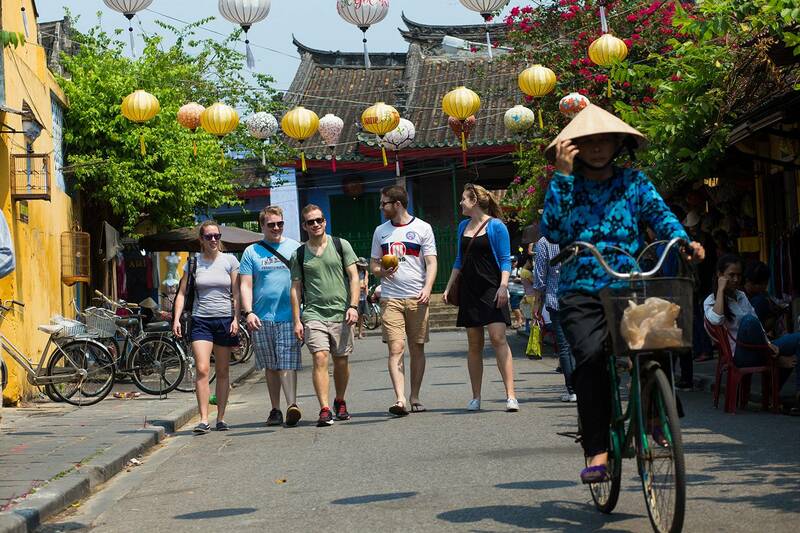 Tuck students explore the streets of Hoi An, Vietnam on a Global Insight Expedition. Vetrano’s experience is typical for anyone traveling abroad whose image of a destination is shaped by sources like movies and books that convey stereotypes more than the nuanced richness of a foreign culture. But for those who aspire to lead in an increasingly globalized world, such stereotypes are especially important to counter. To accelerate that process, two years ago Tuck launched the global learning requirement known as TuckGO. The requirement connects students to the dynamism of the world economy through a portfolio of program options: faculty-led global immersion courses (GIX), project-based client engagements (First-Year Project and OnSite Global Consulting), and term exchanges with other leading schools. GIX courses are each organized around a distinct theme. Miller recruited Dirk Vandewalle, a professor in the government department at Dartmouth and adjunct professor at Tuck, to lead two GIXs—one to the United Arab Emirates in 2014 and another to the United Arab Emirates and Qatar in 2015. Vandewalle, an expert on state-building and regime change in the Middle East and North Africa, focused the courses on economic and environmental sustainability in the context of increasing globalization. Students visited businesses, ports, and custom-free zones, while Vandewalle lectured on topics including Dubai’s ability to weather the 2008 financial crisis and tensions between Arabs and the immigrant labor force. This year, Jennifer Lind, a government professor and expert in East Asia security, took part in the China GIX, offering critical context about how China thinks of its relationship with the U.S. and views conflict with Vietnam, the Philippines, and other countries in the South China Sea. Tuck has also partnered with the TIAS School for Business and Society in the Netherlands to host TIAS students on campus in the fall, as well as bring Tuck students to the Netherlands for a GIX in the spring. The goal of the partnership is for both sets of students to learn more about their host country’s health care, and shared challenges and opportunities. The goal of TuckGO, says Miller, is to help students develop a “global mindset,” which includes not only an awareness of other cultures, but also empathy for why things are done differently, and agility to work within diverse business environments—traits all wise leaders possess. “In order to understand the economy of Vietnam, you need to understand the politics,” says Curt Welling D’71, T’77, senior fellow at the Center for Business, Government, & Society and former CEO at Americares. Welling co-led the Vietnam GIX with Ed Miller, an associate professor of history at Dartmouth who specializes in the study of modern Vietnam and the Vietnam War. The course focused on Vietnam’s uneven economic history and how it continues to affect its politics. After adopting a Stalinist-type command-and-control economy after the war, the country instituted a number of reforms in the 1980s to liberalize its economy. Today it is caught between the two paradigms: communist in name, but capitalist in practice; embracing free trade, but with the government still firmly in charge of the economy. The GIX explored the full range of these contradictions, visiting with both state-owned industries outside Hanoi, and young entrepreneurs in the dynamic streets of Ho Chi Minh City. OnSite Global Consulting teams are also increasingly reaching across Dartmouth—and disciplines—to enrich the consulting projects they undertake for businesses and nonprofits. In the past year, an OnSite team led by professor Steve Powell partnered with Annabel Martin, director of the Gender Research Institute at Dartmouth, on a consulting project involving Tuck students and Dartmouth undergraduates for the University of Pristina in Kosovo, and Dartmouth anthropology professor Dale Eickelman, to develop a strategic plan and assess the feasibility of a new graduate degree program for the American University of Kuwait’s College of Business and Economics. In Japan this past spring, Tuck students worked on another OnSite project through support from a Mitsui USA Foundation grant to develop safety protocols for Hunger Free World, a nongovernmental organization that builds houses and wells in developing countries. “A lot of the workers on the projects are community volunteers, and so much of the work was thinking through how they could ensure their safety on projects,” says Saline Jiang T’16.